IF YOU WERE WONDERING WHERE THE COLOR CAME FROM, LOOK AT THE 1962 CATALINA THAT WON DAYTONA (IT IS ON DISPLAY AT TALLADEGA MOTOR SPEEDWAY) SMOKEY YUNICK WAS THE MECHANIC. THE BLACK/GOLD WAS SMOKEY YUNICK’S COLORS AND “MONK” PAINTED THE 1964 GTO AND ALSO HIS 1971 T-37, (CURRENTLY OWNED BY MIKE MINER, SPRINGTON, TEX.) BLACK AND GOLD. THE BLACK/GOLD 64 GTO RAN THE LAST 389 SUPERMDUTY THAT SMOKEY YUNICK BUILT FOR NASCAR. IT WAS COUPLED TO A TURBO 400 WITH A 4500 STALL. (THE CONVERTER WAS BUILT BY A FRIEND AT B&M) IT RAN A 2-BARREL CARBURETOR! THE CAR RAN AT IHRA, AHRA, AND NHRA MEETS. ACCORDING TO THE DRIVER (LARRY WOODSEN) THE CAR WON A LOT OF MONEY. HE ADVISED THAT THE CAR WAS VERY CONSISTENT AND RAN A VARIETY OF CLASSES. (DEPENDING ON THE SANCTIONING BODY THAT WAS RUNNING THE MEET) IT RAN TOP ELIMINATOR CLASSES, B/GAS AMONG OTHERS. 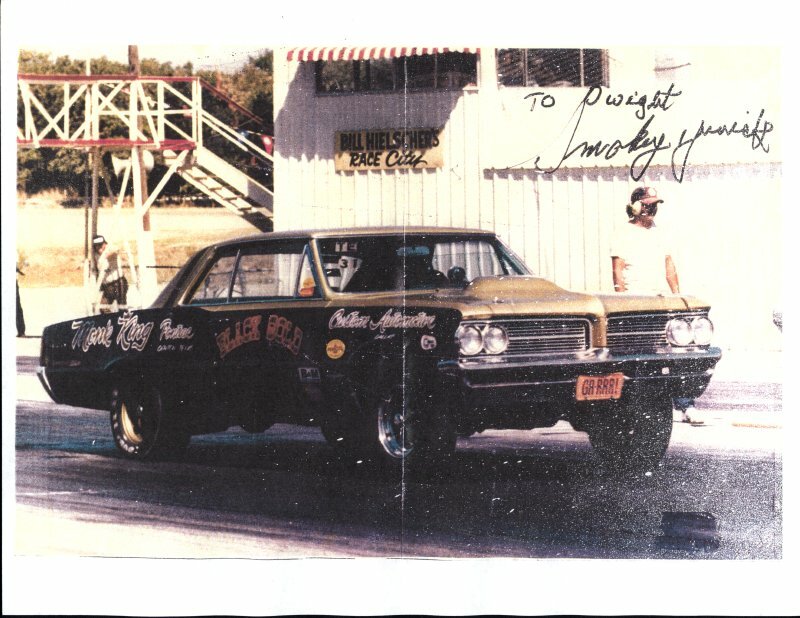 THE PICTURE TAKEN OF THE CAR LEAVING THE STARTING LINE IS AT GREEN VALLEY DRAG STRIP, SMITH FIELD, TX. IT WAS A AHRA EVENT. BACK IN THE 1960’S THEY PHYSICALLY PLACED THE CAR ON THE TRACK THE NUMBER OF CAR LENGTH’S THAT YOU SPOTTED. DEPENDING ON YOUR E.T. A 2-BARREL CAR HAD AN CLASS ADVANTAGE. IN 1970 SMOKEY YUNICK BUILT A 366 PONTIAC TUNNEL-PORT MOTOR FOR THE CAR. (IT HAD BEEN RUNNING THE 389 SUPERDUTY FOR YEARS) THE CAR RAN THE BEST TIME OF 11.91 AND OVER 120MPH WITH THE 366 ENGINE. ACCORDING TO WOODSEN THE CAR WOULD NOT LEAVE THE LINE WELL. IT WAS TWISTED TO 8500 RPM’S. THE CAR HAS A 4:88 12 BOLT REAR-END IN IT NOW. IT RAN 9 INCH SLICKS. THE BEST TIME WITH A 389 SUPER DUTY WAS 12.10. IT WAS TWISTED ABOUT 6800 RPMS. LARRY WOODSEN ADVISED THAT THE CAR WAS SO CONSISTENT WITH THE 389 SD TWO BBL. CARB., THAT YOU COULD DIAL IT IN AT 12.64 AND IT WOULD RUN IT ALL DAY LONG. HE ADVISED THAT IT WON A LOT OF MONEY WHILE IT WAS RACED. IT WAS PARKED IN 1975. I TALKED WITH SMOKEY YUNICK AT THE POCI NATIONAL CONVENTION LAST YEAR IN DENVER, COLO. WE TALKED ABOUT RACING AND THE MONK KING CONNECTION. HE ADVISED THAT HE WAS A PALLBEARER AT MONK KING’S FUNERAL. HE FONDLY REMEMBERED MONK KING. HE REMEMBERED THE BLACK/GOLD 1964 GTO AND HE AUTOGRAPHED THE PICTURE FOR ME. I ASKED HIM WHAT KIND OF RPM’S DID THEY TWIST THE NASCAR 389 AND 421 SUPER DUTY ENGINES BACK IN 1961, 1962. HE ADVISED “6,800 ALL DAY LONG” HE FURTHER COMMENTED THAT WITH TODAY’S TECHNOLOGY HE COULD MAKE THE OLD SD MOTORS TWIST 9,000 RPM’S. . This is an exact copy of the letter sent from Dwight Crawford to Don Deppe.